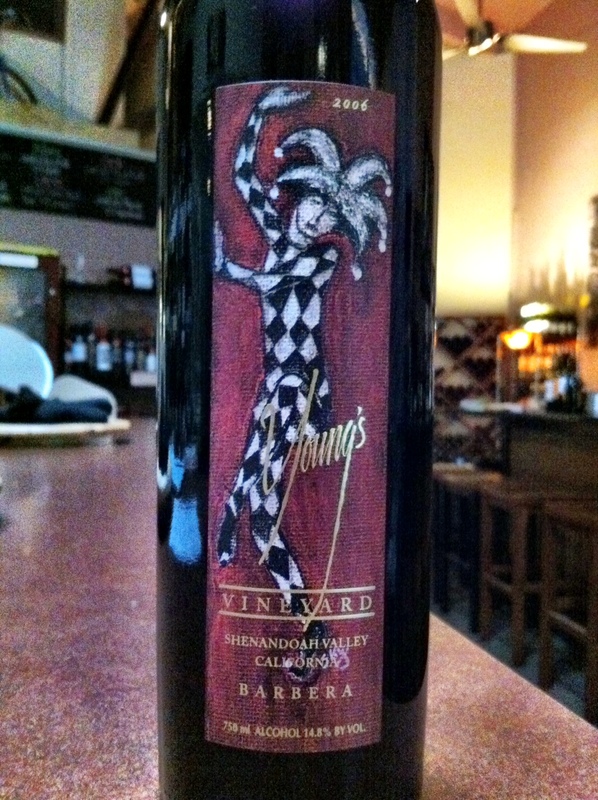 Young’s Barbera, 2006 California | the wine snob. Well, I was all set to declare Summer 2011 to be the Summer of Rose this week, and dive right in to a Rose. I had one all picked out. Okay, so maybe I declared last summer the Summer of Rose. But in my mind, EVERY summer should be the Summer of Rose. That is, until I saw the forecast. Rain, rain, rain. Cold, cold, cold. These things do not indicate good Rose drinking weather. So I perseverated about one last Big Red to write about this week. Which was difficult, because I was reeeeeeeeally in the mood for whites and roses. But after three straight days of rain, I’m singing a different tune. Actually, I don’t know why I didn’t write about this one sooner, considering how popular it’s been at the last few wine sales! The craze started over the winter with their Petite Sirah. We sold it out- case after case. Then we sold out the Syrah. Now we’ve moved on to the Barbera, and it’s holding steady for us for the moment. We even decided to put it on by the glass this week! The Young’s wines really seem to hit the nail on the head for many of our wine shoppers and drinkers as far as value is concerned- this bottle retails for just $12, and it’s formidable size make it a whopper of a deal. It’s the epitome of juicy! A nice combo of dark and red fruits like plums, pomegranates and blackberries, with nice complex notes of kirsch liqueur and light spices. Barbera is not known for having a ton of tannin, so I’m impressed that all this fruitiness is so potent after 5 years in the bottle. This is a perfect wine to keep around for entertaining- Burger night, Pizza night, dancing to Michael Jackson: the Experience night… pretty much anything goes with this wine. Another reason I love this wine- the label art! It’s pretty and feminine yet somewhat sultry. Check out the artist’s website here! We’ll have this wine on by the glass as long as it lasts, so you can grab a taste the next time you’re in our corner of Five Points! I drank mine last night! I mean… I opened the bottle last night. I certainly didn’t drink it all. No, no, not me.